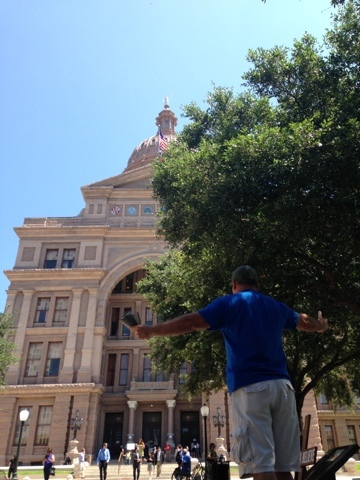 On July 10, 2013 me and a few brothers drove down to Austin Texas to preach the gospel at the Texas State Capitol. Much of what had been going on around the Capitol had bothered me. It all revolved around politicking, one group calls themselves pro-choice though that name is deceptive, because that choice results in the brutal death of another human being. The other group calls themselves pro-life but the bill that was before the Texas legislator was not then and now that it is law, it is not pro-life. The bill allows for the brutal death of children in the womb at 20 weeks of life or less as long as it is done inside of a surgery center. Now I ask you, what is pro-life about that? You know the answer, it is not pro-life, it is in fact pro-death. While the bill that was before the Texas legislature was supported by peoples that call themselves pro-life, the bill itself is not pro-life. So why all the fuss and fighting about this bill in the legislature, among the people, and the media. The pro-choice group's agenda is abortion on demand without restraint from God or man regardless of the age or developmental level of the child in the womb. This bill puts limits on that unabated destruction of a child in the womb; while some call this a victory for pro-life I do believe they are kidding themselves. This bill is no more pro-life than the Nazis choosing to kill some Jews while allowing others to live. So why did we go to Austin? We went to preach the gospel of Jesus Christ in a place where lies are being told. To preach the gospel to a people dead in their trespasses and sins. Psalm 96:3 says, "Declare His glory among the nations, His wonders among all peoples". This world belongs to Christ; "The earth is the Lord's, and all it contains, The world, and those who dwell in it." (Psalm 24:1) Jesus is the Christ, the Son of the Living God; God has furnished proof to all men by raising Him from the dead. After His resurrection Jesus said to His disciples; "All authority has been given to Me in heaven and on earth. Go therefore and make disciples of all the nations, baptizing them in the name of the Father and the Son and the Holy Spirit," (Matthew 28:18-19) and the way He told them to do this is through the preaching of the gospel. "And He said to them, “ Go into all the world and preach the gospel to all creation. He who has believed and has been baptized shall be saved; but he who has disbelieved shall be condemned." (Mark 16:15-16). It is not through political means that we declare the glory of God and make disciples, it is through the preaching of the gospel. Do you want to change a nation? Then go preach the gospel to the glory of God. "Therefore if anyone is in Christ, he is a new creature; the old things passed away; behold, new things have come" (2 Corinthians 5:17). New creatures act differently, they think differently, and they speak differently.